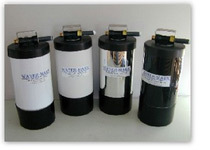 The unit comes in 4 different colors.The Water-Mark softener / filter is just 22 inches high and 9 inches in diameter. 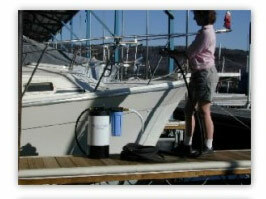 It weights about 40 pounds empty and is very stable so you can set it on the dock or ground. 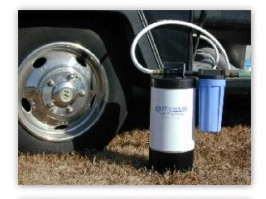 The commercial tank is rated at 150 PSI at 120 Deg. New 304 Stainless Steel Cap and Cover option.This is the best lifetime finish available. No other competitors finish will compare or outlast Stainless Steel. Stainless Steel will never CRACK, RUST, or FADE in the sun. 1 - 48" connector hose W/female ends. "Water potable" water hose w/ heavy female ends. Safe to drink, leaves no taste. 2 - Pre-filter housing with a 20 Micron Sediment Cartridge. Pre-filter’s housing is Opaque Blue to stop light. ( Other brands that sell per-filters that have clear bowls will accelerate mold growth if left in sunlight.) Housing comes with 3/4 NPT ports and a heavy solid brass female hose fitting. 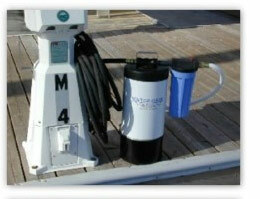 Fill your onboard boat or RV water storage tank, or install in-line on your water supply on the dock. Also, water suds up easier with less soap usage. 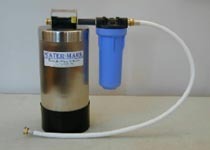 Minimizes water spots and hard water stains caused by minerals. 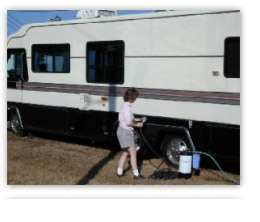 Great for washing your RV and take it with you on the road so you have soft water when you hook up your RV.